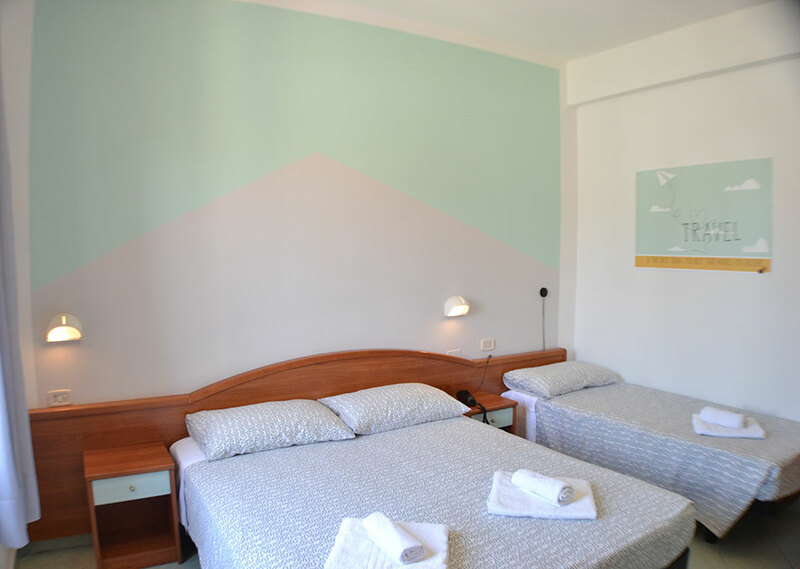 Villa Caterina is a 3-star inexpensive hotel in Marina Centro of Rimini, chosen by many young people looking for convenient places to stay, close to the sea. The rooms are simple and furnished in a contemporary style. 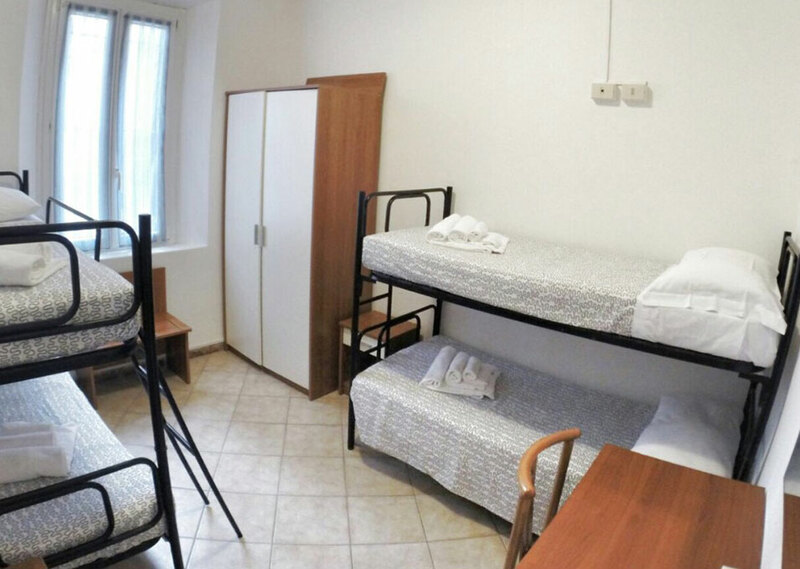 There are many types available: single, double, twin, triple, quadruple, as well as the Family Room for 6 people. Each room has free Wi-Fi, a 19" LCD TV, air conditioning, a safe and an en suite bathroom with a shower and hairdryer. Some rooms have a balcony. 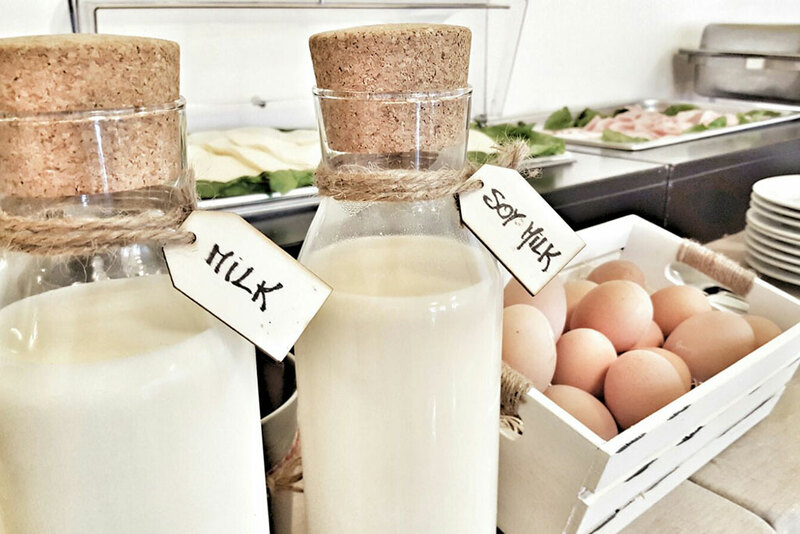 The breakfast buffet, available every morning in the breakfast room, includes freshly baked cakes and pies, pastry, fruit, juice, yogurt, cereal, jams and, on request, products for celiacs, as well as eggs, cold cuts and savory pies. For lunch and dinner, we can recommend the best restaurants, pubs and pizzerias in Marina Centro - you can reach them all on foot, in just a few minutes. You can take advantage of our collaborating restaurants to eat well at reduced prices. Moreover, at our hotel, you have at your disposal a fully equipped bar. And the fun? You have a lot of choice. The beach is 300 meters away: it means that it takes less than 5 minutes on foot to get to the sea. With our beach service, you can book a sun bed and umbrella at the hotel, in comfort and at affordable prices. 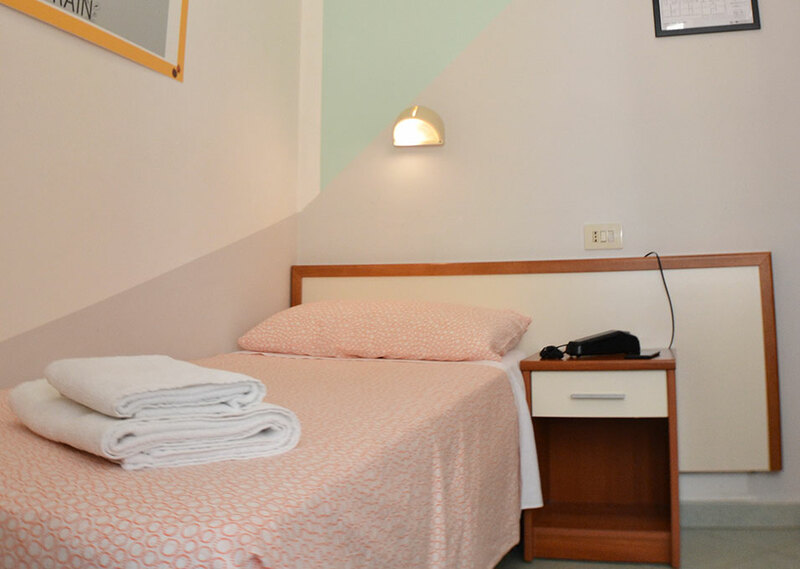 In the evening, the lights of the most popular clubs of Rimini nightlife sparkle on Viale Vespucci and on the seafront - the premises are all within walking distance of the hotel. At the reception you can book your evening in some of the most exclusive nightclubs on the Riviera. Emotions and pure adrenaline await you in the theme parks of Rimini and surroundings. Here you can buy tickets for Mirabilandia and many other attractions. You can comfortably reach the hotel with your car, unload your luggage and check-in. We will give you directions to park for free in the immediate surroundings - public parking according to availability - or in a collaborating guarded parking (a few euros per day), a 15-minute walk away. 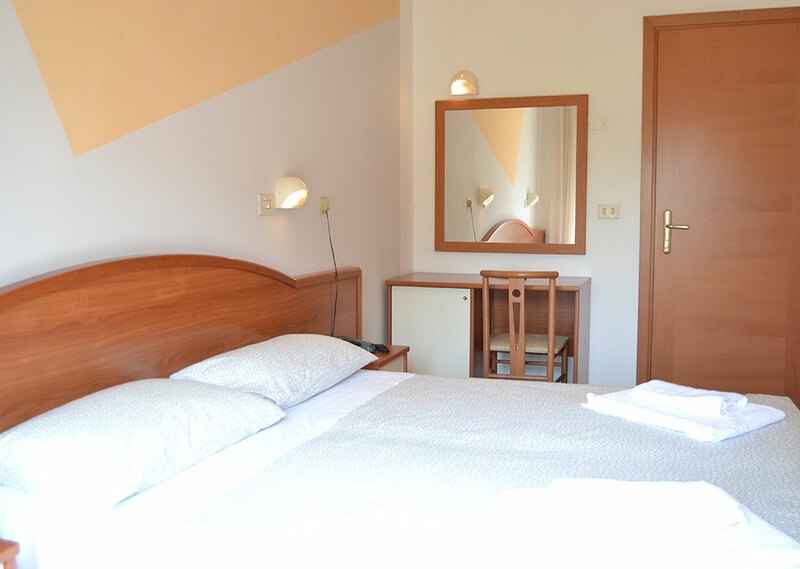 All rooms are furnished in a contemporary style, with warm colors ranging from brown to cream. If you travel with your children, choose the Family Room: it can accommodate up to 6 people and consists of 2 rooms with separate entrance. 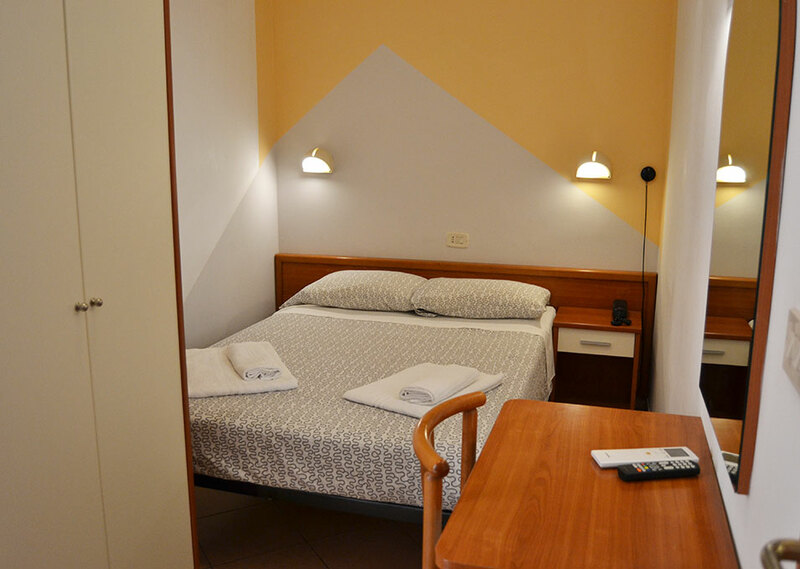 Each type has free Wi-Fi, a 19" LCD TV, air conditioning, a safe, private bathroom with shower and hairdryer. Some rooms have a balcony. They are not soundproofed and do not have sea view. This room is very small, only 8 square meters, and does not have a balcony. It includes a window, free Wi-Fi, a 19" LCD TV, a hairdryer, air conditioning and a safe. The bathroom is small and has a shower. It is not soundproofed and does not have sea view. Ideal room for those looking for an inexpensive and functional solution. It does not have a balcony but has a window. It comes with free Wi-Fi, a 19” LCD TV, a hairdryer, air conditioning, a safe and a private bathroom with a shower. It is not soundproofed and does not have sea view. Some rooms have a balcony. It comes with free Wi-Fi, a 19” LCD TV, a hairdryer, air conditioning, a safe and a private bathroom with a shower. It does not have a balcony but has a window. It comes with free Wi-Fi, a 19” LCD TV, a hairdryer, air conditioning, a safe and a private bathroom with a shower. This is the most spacious type. It has a private bathroom with a shower and a window, free Wi-Fi, a 19 "LCD TV, a hairdryer, air conditioning and a safe. Some have a balcony, others have a window. These rooms are not soundproofed and do not have a sea view. This type consists of 2 rooms with private entrance. It does not have a balcony, but has windows in all rooms. It comes with free Wi-Fi, a 19” LCD TV, a hairdryer, air conditioning, a safe and a private bathroom with a shower. This type of room is not soundproofed and has no sea view.